Brad Mahlstedt, head of the Whittier Republican Leadership Council, is under attack for his role in bringing Nonie Darwish to speak at Whittier Law School September 22. Bill Carnahan, the school's assistant dean for student services, threatened to file a "formal complaint" against the council after IPT News reported on Carnahan's weak response to Islamist pressure against Darwish. In the weeks leading up to Darwish's speech, opponents of her message launched a campaign defaming her on Facebook and Twitter, suggesting that she was unqualified to speak about the oppression of women under sharia. But despite their best efforts, nearly 100 people were in the audience to hear Darwish at Whittier Tuesday afternoon. Her speech went off without any disruption. "We wanted to bring students to debate" the issue in a careful, non-polemical way, Mahlstedt said, adding that that goal was achieved at the Whittier event. Everyone, including audience members who disagreed with the substance of Darwish's message, "was extremely respectful. No one I spoke to felt she was a 'hate speaker,'" Mahlstedt told IPT News. But some Darwish critics who did not hear her lecture were furious with Mahlstedt for bringing her to campus. After Mahlstedt forwarded Tuesday's IPT News story reporting on the campaign to silence Darwish to other students, he began receiving angry e-mails from some of them. One posting read in part: "BRAD MAHLSTEDT!!!!! THIS IS YOUR CALL OUT …stop posting ridiculous stuff to my wall like the videos and articles (I do not agree with you) …The 'Islamists' on campus went really far to stop her speech…You are an idiot or borderline retarded; regardless, you're treading on thin ice my friend so plz stop." The student called Mahlstedt "ridiculous and ignorant." Another student called Mahlstedt "malicious" and said he showed "disregard for any of our feelings" by giving Nonie Darwish a forum. Yet another said she is "sick of this kid and his close minded [sic] ideas and articles. he [sic] is a retarded idiot and is offending a culture and society with his ridiculous ideas." The student asserted that Mahlstedt "is just lying to everyone and creating hostility on campus." Even more troubling is Dean Carnahan's recent behavior. On Tuesday – just hours after the IPT News story was posted online – he told Mahlstedt his actions in connection with the Darwish visit were "disgraceful." On Wednesday, Carnahan sent a letter to Mahlstedt attacking him over an "unauthorized quote from me." This is a reference to the fact that IPT News reported that Carnahan said in July that a Darwish speech would be no problem but reversed himself after Muslim students at Whittier complained. They urged that Darwish's speech be delayed until after Ramadan so as not to offend the school's "diverse" student population. Mahlstedt stood his ground, stating that he did not understand why Muslims would "find it offensive to hear from a woman speaking out about a radical sect of Islamic fundamentalists" that deny women equal rights and behead homosexuals. In his letter to Mahlstedt, Carnahan said "you are on notice NEVER to quote me in anything without my permission." In reference to the IPT News story, Carnahan added that he is "greatly disappointed by this article, unattributed to any source, and by your active participation in distributing the article." Carnahan added that he found our story "extremely offensive" and told Mahlstedt that he finds it "even more offensive that you, or someone else associated with your 'organization,' would provide unauthorized quotes." Carnahan said he is asking the Student Bar Association at Whittier to take unspecified "action" against the Republican Leadership Council and that he is "contemplating a formal complaint" against the Republican group. It will be interesting to see how far Carnahan is prepared to go in pressing for action against a student and a student organization because of their "active participation in distributing" a news story. 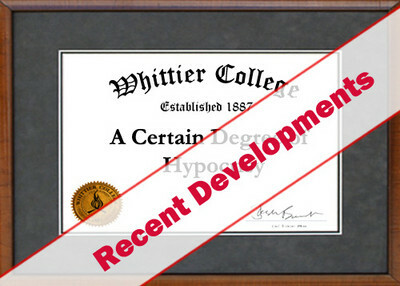 Perhaps the most bizarre aspect of the case is this: While an assistant law school dean is threatening a student with disciplinary action for handing out a story critical of the Whittier administration, school President Sharon Herzberger and law school Dean Penelope Bryan seem to have gone into hiding. But the story isn't likely to go away anytime soon. As this story went to press, there were reports that Mahlstedt was seeking legal counsel to pursue the case. The fallout from Whittier's mishandling of the Nonie Darwish speech could potentially land the school in court. As an adjunct teacher at UC-Irvine, I had the pleasure to attend a Nonie Darwish lecture at UCI a few years back. This woman puts her life on the line to speak truth. In the UCI case, deans paced outside the lecture hall but would not come in and listen. Yet, shortly before, the packed the hall to hear Norman Finklestein and laugh at his vicious jokes and attacks on others. I intend to post this story on fousesquawk and radarsite.